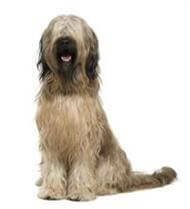 Hundreds of years ago the Briard was used to protect flocks of sheep and goats from poachers and wolves. More recently they ‘served’ in World War I carrying supplies to the front line for French soldiers – their keen hearing was also used by the medical corps to help search for wounded soldiers. Unfortunately their ‘tour of duty’ devastated their numbers and today the breed is quite rare. The Briard can live up to 12 years of age. A wonderfully natured dog that is keen to please its master. However this large dog is outgoing (and sometimes boisterous) and requires firm training from an early age if it is to behave in the proper manner. Though reserved around strangers, the Briard is a trustworthy companion. They are extremely intelligent and possess a beautiful temperament which makes them relatively easy to train. The Briard has a gentle nature and will get along happily with most other pets in the home – especially if they are raised together from an early age. The coat needs regular washing and should be thoroughly brushed each week to keep it free of knots. Plenty of exercise and mental stimulation is needed to prevent boredom and the development of destructive behaviour. Though it is a sturdy animal, some Briards experience hip dysplasia and eye problems so regular vet checks may be required. The Briard is a gentle, friendly dog that loves human company. However, excitement can get the better of them from time to time and should be closely supervised around children and the elderly to discourage jumping up. Owners will also need to provide plenty room to explore and to play around the home.